This is the Romanesque style basilica of the Christian Science Church originally built in 1894; inside it features beautiful examples of American opalescent stained glass illustrating Bible stories. The basilica is part of a sprawling campus of buildings that were designed by I.M. Pei in the 1970s. In the background you can see the Prudential tower and other buildings. 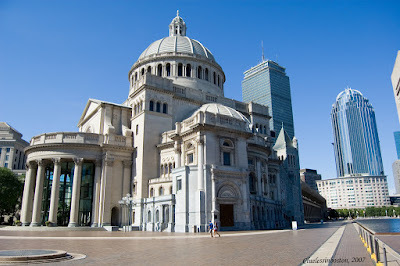 This is interesting, are there other buildings in this style or similar, or is this a unique example of Romanesque in Boston? It hardly looks like it's only been there since the 70s...it looks, well, old and Romanesque! This view is of the extension of the Romanesque original church (visible to the right rear). The extension is renaissance style, built ten years later in 1904. The '70s part are not visible either, being the square (with a reflecting pool), the Sunday School building and a tall building - the new complex having been designed by I M Pei.